At C&D, we are proud of our skilled and experienced staff. Their dedication to the business gives us real operational flexibility, giving us a leading edge in service terms – of paramount importance for the construction industry. As a result, we believe our joint product knowledge is unique in the industry, enabling us to take your schemes from drawings right through to completion, designing and drawing up a compliant specification to the satisfaction of our customers and their clients. C&D Directors Mark Fowler, Carl Drake and John Clydesdale have spent their entire working lives in the construction industry. Their knowledge and supplier contacts help the business operate successfully on a daily basis. Staff are key to any successful business, and the Directors enjoy the support of a loyal, knowledgeable and trustworthy team. The branch is run by Richard Fowler, whose expertise in plastics and heating have helped develop our relationships with local plumbers and national contractors. Warehouse Manager Ron Lucas has worked in the plumbing industry all his life, delivering major contracts on time in full. He is helped by our stockholding levels, combining with Ron's expertise to provide a first class service every time. We have excellent all-rounders in Tom Fowler and Mark Owen, who work with a 'never say no' attitude to ensure our customers always get what they want, when they want it. 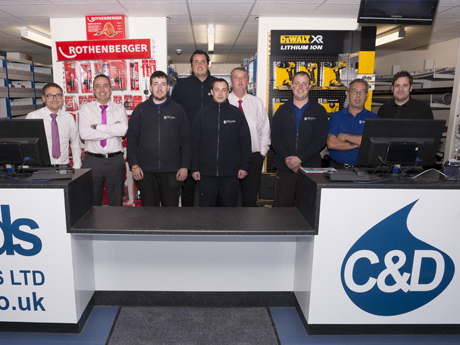 We have also developed a thriving counter business from local plumbers, providing a friendly and professional service and helping to solve potential problems. Drivers Fred and Aidy ensure we get deliveries to our customers safely and reliably – our recent workload in London have made Aidy feel really at home there! We always try to promote from within, and are proud of our trainee programme. Josh Leary completed a very successful training period and has joined the company permanently under Ron's watchful eye. Josh is dedicated to learning about the plumbing industry and his main duties will involve warehouse and counter sales so he gets to know the customers and their expectations.